I am more than happy in your reply to my mail How are you today? How was your day, hope fine. As for me loneliness have been my friend over here in Dakar Senegal and in this camp we don't allowed to go out from the camp any how sometimes we used to take permission,Its just like one staying in the prison and i hope by God's grace i will come out here soon. My name is miss Augustina WILLIAMS, 25 years old from of Sudan and presently i am residing in the refugee camp here in Dakar Senegal under the UNITED NATIONS COUNCIL FOR REFUGEES as a result of the the killing of my family by the rebels, please don't be discouraged for hearing this.I believe deep down inside me that you will never break my heart or let me down in anyway. l don't have any relatives now whom l can go to all my relatives ran away in the middle of the war the only person l have now is Reverend Father Michael who is the pastor of the (Christ for all Churches) here in the camp, he has been very nice to me since i came here but i am not living with him rather i am leaving in the woman's hostel because the camp have two hostels one for men the other for women. 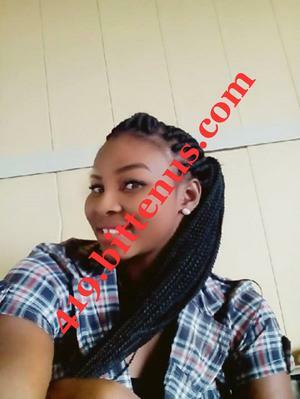 The Pastor's Phone number is, +221777732831 if you call tell him that you want to speak with the Augustina WILLIAMS i from Sudan, he will send for me in the hostel to talk to you. As a refugee here i don't have any right or privilege to anything, be it money or whatever because it is against the law of this country. I want to go back to my studies because i only attended my first year before the tragic incident that lead to my being in this situation now took place. Please listen to this, i have my late father's deposit certificate and death certificate here with me which i will send to you later, because when he was alive he deposited some amount of money in a bank which he used my name as the next of kin as the fest chide, the amount in question is $5.3 M (five million three hundred thousand US dollars). So i will like you to help me transfer this money to your account and from it you can send some money for me to get my traveling documents and air ticket to come over to your country to meet you.I kept this secret to people in the camp here the only person that knows about it is the Reverend because he is like a father to me. As soon as i have all this information's i will give you the bank contact where the money was deposited for you to contact them on my behalf for the transfer. Remember i am giving you all this information due to the trust my mind found on you.I like honest and understanding people,truthful and a man of vision,truth and hard working who can invest this money wisely.My favorite language is English l speak it very fluently. Meanwhile i will like you to call me and like i said i have a lot to tell you. Have a nice day while you think about me. 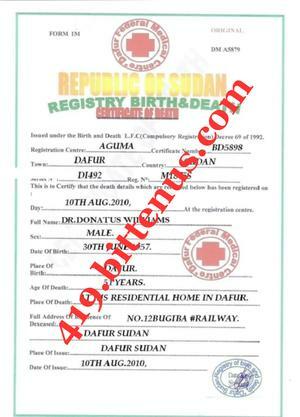 Sir, I am miss Augustina Williams, the surviving daughter of late DR LATE DR DONATUS WILLIAMS from Sudan, whose fund is deposited in your bank with the following account number HBM09000750006061 i am writing to inform the Bank Management that Mr. , with the following contact information's. Is my Representative/trustee. So every necessary information, procedure and assistance should be accorded to him in regard to the transfer of my late father's fund to his account and amount of his choice until the total amount is completely transferred into his account. Thank you for your co-operation and understanding sir and am looking forward to your prompt response. Information about my late father and his account details are as follows. Next Of Kin Miss Augustina Williams. ARCLAYS BANK OF LONDON PLC. In view of the request for claims, closure and transfer of deposited fund belonging to late Dr. Donatus Desmond family to you on behalf of his daughter who sent us a nomination letter introducing you as her partner / trustee, thorough investigation has been conducted and information coincided with what we have in our records. Be informed that before we can effect further transfer of 5.3m USD (Five million three hundred thousand united sated dollars) we need to receive the following documents from you to prove that you have been mandated by his next of kin Miss Augustina Williams in Senegal. (1) A scanned copy of your identity must be sent to us by email attachment. 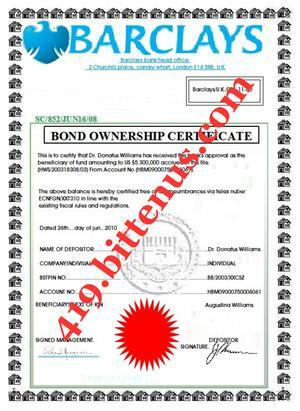 (2) A scan copy of Dr. Donatus Desmond Death Certificate. (3) A power of attorney from high court of Senegal signed / notarized by a Senegal based lawyer. (4) A Sworn affidavit from high court of Senegal signed / notarized by a Senegal based lawyer. We hope that you will understand that our request for the above information is part our security protocols to avoid fraudulent claims or an unwarranted taking advantage of his absence by some individuals or some other distance relations who might have had access to his privacy. On receipts of the above mentioned, we shall verify them and shall process your claim to effect the transfer into your nominated bank account without delay. Subject: Please darling contact the lawyer for the procurement of the remaining document! Tell the lawyer that you are emailing him on behalf of Miss.Augustina the young lady that visited his office today with the Rev father ,contact him and follow up with him to avoid delay and the bank is waiting for us. BARRISTER SCOTT AKIN CHAMBERS . 45, BOULEVARD DE LA REPUBLIQUE DAKAR SENEGAL. 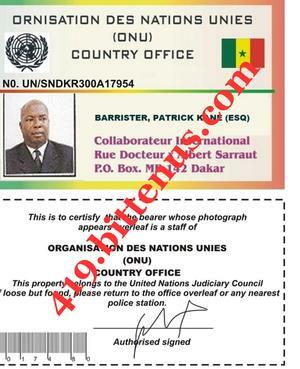 WELCOME TO UNITED NATION REPRESENTATIVE FOR HUMAN RIGHT IN SENEGAL. LIEU WITH MY DISCUSSION WITH YOUR PARTNER MISS, Augustina Williams, ON HOW TO GET A LETTER OF AFFIDAVIT AND PREPARATION OF POWER OF AN ATTORNEY FOR YOU AND YOUR PARTNER THAT WILL GIVE YOU A LEGAL SUPPORT TO STAND ON HER BEHALF AS HER PARTNER/TRUSTEE IN TRANSFERRING HER LATE FATHER'S FUND DEPOSITED WITH FROM BARCLAY'S BANK OF LONDON PLC� INTO YOUR BANK ACCOUNT. IN VIEW OF THE ABOVE, AND PRIOR TO MY INQUIRY FROM THE FEDERAL HIGH COURT OF SENEGAL. BELOW IS THE COST OF PREPARING/AUTHENTICATION OF THE MENTIONED DOCUMENT'S. TOTAL SUM WILL BE $780 US DOLLARS ONLY TO GET EVERYTHING DONE. BELOW IS MY INFORMATION WHICH YOU WILL USE TO SEND THE MONEY TO MY LAW FIRM THROUGH WESTERN UNION MONEY TRANSFER BASS YOUR COUNTRY WHICH IS THE FASTEST MEANS OF RECEIVING MONEY HERE. DESTINATION OF THE MONEY: DAKAR SENEGAL. YOUR FASTEST ACTION TOWARDS SENDING THIS MONEY WILL BE HIGHLY APPRECIATED TO ENABLE MY NOBLE LAW FIRM TO EXECUTE YOUR JOB IMMEDIATELY. ATTACHMENT IS MY IDENTITY CARD. 45, BOULEVARD DE LA REPUBLIQUE DAKAR SENEGAL. DATE: 16/04/2014. PRIOR TO YOUR REQUEST TO MY NOBLE CHAMBER WAS HIGHLY WELCOME. BELOW IS THE BANK INFORMATION THAT YOU WILL USE TO WIRE THE MONEY AS YOU SAID THAT, SENDING IT THROUGH CASH BOOKERS IS NOT YOUR PREFERRED METHOD.